Follow Friday Fun Week 18: This weekly meme is hosted by Parajunkee and Alison Can Read. Check out their blogs for details/rules, and to join! Also, be sure to check out this week's featured bloggers on each of the girls' sites! This week's question: If you could have dinner with your favorite book character, who would it be and what would you serve? TGIF at GReads Week 14: TGIF is hosted by Ginger at GReads - be sure to check out her blog and join in the fun! This week's question: Spooktacular Reads: Which books do you consider festive Halloween reads? Which stories have chilled you to the bone? I love reading anything paranormal during October, which is why I came up with the Paranormal Reading Challenge. For people who are into ghosts and mysteries, I'd definitely recommend Heather Graham's Adam Harrison Investigations series. They were my introduction to mystery books a few years ago, and some of them are pretty scary (for me anyway, but I'm a total wuss when it comes to scary things lol). Because I don't really read horror, I can't talk too much about that...the only Stephen King book I've read is Carrie, and I didn't see what was so scary (or great) about it, even though some people have said it's really scary. I'd love to read The Shining, but I need to gear myself up for it, I think haha. Happy Friday, and happy almost Halloween! I hope you've all had a great week. Be sure to leave a comment below, and if you participate in either of these memes, leave a link to your post. Oh I haven't thought of Anne of Green Gables in years. Love that show as a kid. Good choice. Classic! My answer is PUCK from The Iron Fey! Hopping through. I think raspberry cordial would be required for tea with Anne. I bet she wouldn't drink it though - bad memories. At least you wouldn't have to worry about getting drunk accidentally if Anne mixed up and gave you alcohol! ;D Great pick! I love Anne! here is my Followe Friday ! and I am a new follower ;) ! You can't have Anne over and NOT serve cordial! 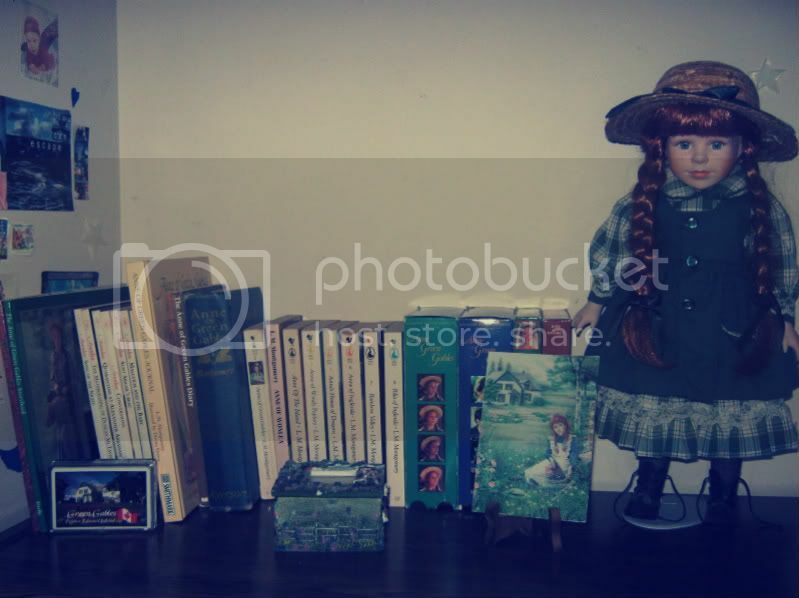 I haven't read Anne of Green Gables in such a long time, but that scene always sticks with me! lol! Now I want to read it again, and then the rest of the Anne Shirley books. She's such a fun character! Anne is a fabulous choice! I adore her!